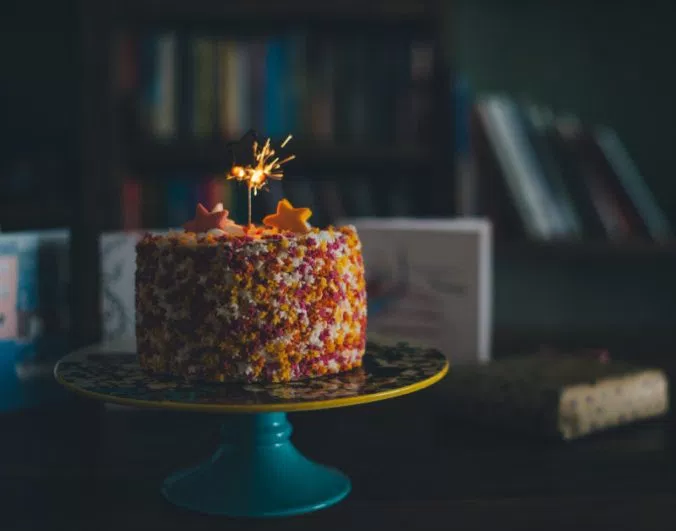 Three ways to make grown-up birthdays magical again. Growing up, March 28 was my favorite day of the year. On this one day, I felt more special and more celebrated than on any other day. Even as an introvert who didn’t always feel comfortable in the spotlight, there was something lovely and magical about a day focused on me. My mom baked my favorite birthday treats to share with my friends (cupcake cones, anyone? ), my teachers gave me special birthday stickers to wear, my grandma took me shopping for new clothes. I didn’t have to be quite as nice to my little sisters, and no one made me clean anything. The best! My birthday was a day where I had full permission to enjoy my life. As an adult, and especially as a parent, birthdays tend to lose their sparkliness and become just one more ordinary day, filled with dirty dishes and smelly diapers and all the work of keeping tiny humans alive and well. And this can be a bit of a let down. We miss the ease of a completely egocentric day, of the world stopping to say how much it appreciates the fact that you were born. We miss the magic. Take in the love. No, your friends probably aren’t showering you with the coolest My Little Pony or Lego set, and your mom may or may not be around to bake you a cake. But for most of us, birthdays are a day where family and friends are much more likely to reach out and remind us of their love. Phone calls, text messages, even Facebook posts from old friends or casual acquaintances, these are all communicating this one truth: we are glad you are in the world. We are glad you were born and have entered our lives. We remember you, we send love and wishes for a beautiful new year your way. It’s easy to get caught up in who didn’t call, to count Facebook posts and cake emojis; and disappointment about friends who forgot or neglected your special day is real. But we mustn’t let it keep us from taking in all the love that is sent our way. Trust it. Breathe it in. Open up to it, this gift that isn’t wrapped in shiny paper but lasts far longer and is far more precious. These are the relationships that make up the stuff of life. They are the gift. Today’s the day to receive them. Treat yo’ self. One of the reasons I loved my birthday as a kid was that on this one day, I had control over much more of my life. I got to decide what to wear, who I wanted to invite to my party, what to eat for dinner AND dessert. I could choose not to practice the piano, and no one ever asked me to clean the bathroom. This sense of agency was unmatched the rest of the year. And it was thrilling. Birthdays are like a free pass to do what you love. And although as grown-ups we still (usually) have to get up and go to work and feed our kiddos and wrestle them into bed, we can still take tiny moments to treat ourselves to things we enjoy. Maybe we get a larger size drink or add on the cookie we’ve been eyeing. Maybe we allow ourselves to actually take a true lunch break, to say no to a project we don’t have time for. Maybe we leave the dirty dishes in the sink this once and watch our favorite show instead. Birthdays give us license to think about what brings us joy, right there in the midst of our regular lives, and then to do it. The world will keep turning! For me, instead of trying to squeeze in some work or wash the dishes, I spent the afternoon outside with my toddler, blowing bubbles in the backyard and giggling as the dog tried to eat them. Children are such wonderful teachers about the pure delight of enjoying what you enjoy. There are always spaces, opportunities for joy in the day to day. Your birthday is a day to look for those spaces and give yourself permission to savor them. Remember the bookends of life. This may sound morbid, but hear me out. When we take a day to remember and celebrate our birth, we acknowledge that we have not always been in this world. We entered through the pain and sweat and tears of our mothers’ labor. And we remember that someday, no one knows when but inevitably someday, we will also take our leave. Our days on this earth are finite. Just as we celebrate the number of our years, we acknowledge that we now have that many years fewer to be alive. And how does that make our birthday magical? By deepening our experience of life in this moment. Joni Mitchell may have sung “You don’t know what you’ve got til it’s gone,” but in a way, remembering that someday it will be gone helps us remember and celebrate what we’ve got. Death reminds us of the preciousness of life. It reminds us of our lack of permanence, that the struggles of today will not last forever, and neither will the joys of today. Remembering our finiteness gives us a deeper urgency to enjoy the now. This moment, we are alive! And life is full of pain and joy, but it is full. Today is the day to give yourself permission to feel all life’s fullness and extend gratitude for the gift that it is to be alive. Open up to the beauty of the now, of this moment, of this precious breath. There is the gift. There is the magic. In the ordinary, sacred right now. Maybe, just maybe, if we open to the possibility that living our lives with intention and openness, with connectedness and perspective, for just this one day, we can find ways to practice finding the magic in each moment, in each day. In this way, we are born in each moment. Magic.